Detective Robert Almeida is assigned to the Area I Criminal Investigations Section. 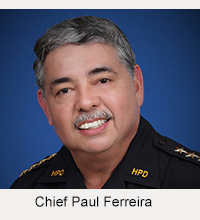 A 22-year veteran of the Hawai’i Police Department, Almeida was most recently a school resource officer in South Hilo. Detective Jason Berryhill is assigned to the Area II Criminal Investigations Section. Berryhill, who joined the Police Department nearly 19 years ago, last served as a patrol officer in the South Kohala District. Sergeant Paul Bugado is assigned to Kona Patrol. Bugado, who has been with the department for more than 17 years, was most recently a community police officer in the South Kohala District. Sergeant Grad Elarionoff, a member of the Police Department for almost 12 years, is assigned to Kona Patrol. His most recent assignment was as a patrol officer in that district. He previously was a Kona vice officer. Detective Joel Field is assigned to the Area I Criminal Investigations Section. Field, who has been with the Police Department nearly 20 years, was a patrol officer assigned to the South Hilo District before his promotion. Sergeant Robert Pauole, who joined the department more than 11 years ago, is assigned to the Traffic Services Section. His last assignment was as a patrol officer assigned to South Hilo. Before that, he was a Traffic Enforcement Unit officer. Detective Brian Prudencio is assigned to the Area II Vice Section’s Ice Task Force. Prudencio, an 11-year veteran of the Police Department, was most recently a patrol officer in South Hilo. Before that, he was a vice officer for six years. Detective Grant Todd is assigned to the Area I Criminal Investigations Section. Todd, who was previously a vice officer, has been with the Police Department since the beginning of the century. 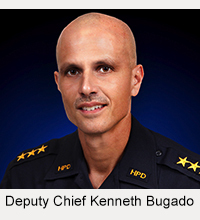 The promotions took effect Wednesday (March 16).